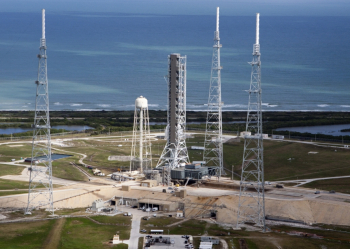 The final work on Kennedy Space Center’s Pad 39B is being conducted in line with the construction and outfitting of systems on the Mobile Launcher (ML) for the Space Launch System (SLS). This multi-element verification and validation (V&V) testing is set to take place next year, a full dress rehearsal ahead of the rollout of the Exploration Mission-1 (EM-1) rocket. 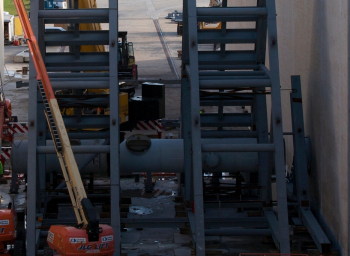 In parallel with the work to outfit the Mobile Launcher, as outlined in an article earlier this week, construction efforts at Launch Pad 39B are also moving towards completion. Work to refurbish the pad flame trench was recently completed, which allowed installation and build up to start for the flame deflector and sound suppression water piping that sit below the launch vehicle and platform. “The sound suppression pipe that you saw go in, that is part of the flame trench flame deflector construction project,” Regina Spellman, GSDO Senior Project Manager for Launch Complex 39B explained in an interview with NASASpaceFlight.com. This deflector will channel the launch vehicle exhaust in one direction — to the north. 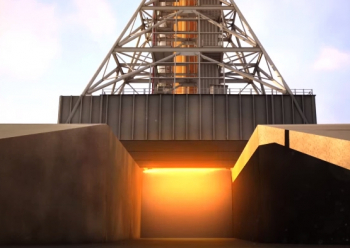 The SLS vehicle and tower will be situated at the pad similarly to the Saturn V, with the tower positioned on the north-side of the vehicle; the flame trench runs in a north-south direction under the launch platform. The approach with the new deflector is different from the Space Shuttle, where exhaust was channeled both to the north and south. The sound suppression water system fill will be fed with 400,000 gallons of water from the pad water tower. Spellman noted that they are planning on testing the different legs of the system before the launch vehicle gets to the pad. “Once we’re finished with the flame deflector and prior to the Mobile Launcher coming out, we’re going to flow that water — because we have done some modifications to that system and we’re putting in a new header underneath the deflector, we want to run water through that before the Mobile Launcher comes out there,” she said. The flame deflector is one of the handful of big projects remaining at the pad. “We have three projects that are remaining of our large projects and then several small things that we have to finish up,” Spellman added. “The flame trench flame deflector is one of those, the liquid hydrogen separator [is another]. That should be finishing up within the month. The addition of the separator to the hydrogen venting system at the pad was driven by differences between the Shuttle vehicle and SLS. “During Shuttle, when they would drain off the hydrogen from the vehicle it would go to the flare stack and be burned off,” Spellman explained. “It would warm up enough that when it got to the flare stack it would be in a gaseous state. 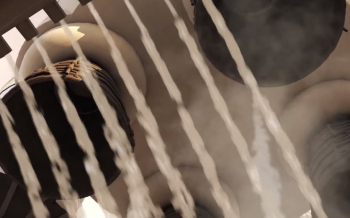 “For SLS, we are actually using hydrogen also for cooling of the engines. Because of the amount of hydrogen that we’re using, when they drain it back the analysis has shown that it may not all be in gaseous form when it hits the flare stack and so the separator is kind of like an above ground septic tank, if you will, where it gathers the liquid and allows it to warm up. Spellman also noted the additional consumption of hydrogen was one of the factors that drove starting the construction project for an additional liquid hydrogen sphere at Pad B, although it won’t be required until the SLS Block 1B vehicle flies, which is planned for its debut on the second SLS launch. 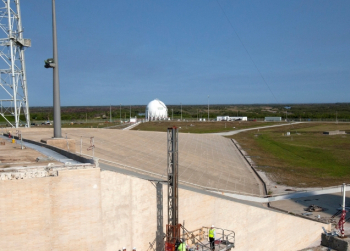 Although not a construction project, another sign of the pad returning to operational status will be the refilling of the liquid oxygen and liquid hydrogen cryogenic spheres there. “We’re going to fill them both at the same time,” Spellman noted. “We’re going to start hopefully sometime in the September time-frame and it’ll take about six months to get both of them completely full. The reason it takes so long is one, just the quantity that is required — both of them are almost 900000 gallons and we fill them with tankers. 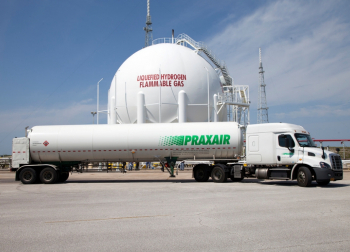 “We have a wave of tankers come in and fill these, so it takes time just to accumulate that amount or quantity and also because all of the steel structure is at ambient temperature, which right now in Florida is pretty hot. So we fill them with the cryogenics and we start to cool down the structure. Those waves of tankers will continue to make regular visits to replenish boiloff of the commodities, and given that the first launch has slipped into 2019, NASA has waited to start the process. Spellman also noted that both spheres went through refurbishment while they were drained. “Both of them have been refurbished and repainted and just basic corrosion control of the spheres themselves,” she said. “We did top off the Perlite — the sphere actually has an inner sphere inside of it and the annular space between the two spheres has an insulating material called Perlite. The current forecast shows that the Mobile Launcher will be ready to move into substantial integrated testing first in the VAB and then out at Pad 39B early next year. Crawler Transporter 2 will pick it up and transport the ML to the pad first for some fit checks. “First we’ll leave the park site where we’re doing construction and we’ll head to the pad for…probably a week to do some mechanical fit checks,” Cliff Lanham, GSDO Senior Project Manager for the Mobile Launcher said. 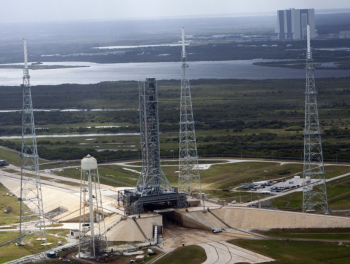 “Then from there, we’ll roll into the VAB — that’s probably in the mid-January time-frame.